Gifts from the Pirates: "And here comes your cake, which was baked just for you. Happy birthday, dear baby! HAPPY BIRTHDAY TO YOU!" "And here comes your cake, which was baked just for you. Happy birthday, dear baby! HAPPY BIRTHDAY TO YOU!" I wanted to get a post written last night about the last minute preparations for Opeie's birthday today, unfortunately there were so many last minute preparations that i was up until 1:45 this morning taking care of them and now feel like a zombie. 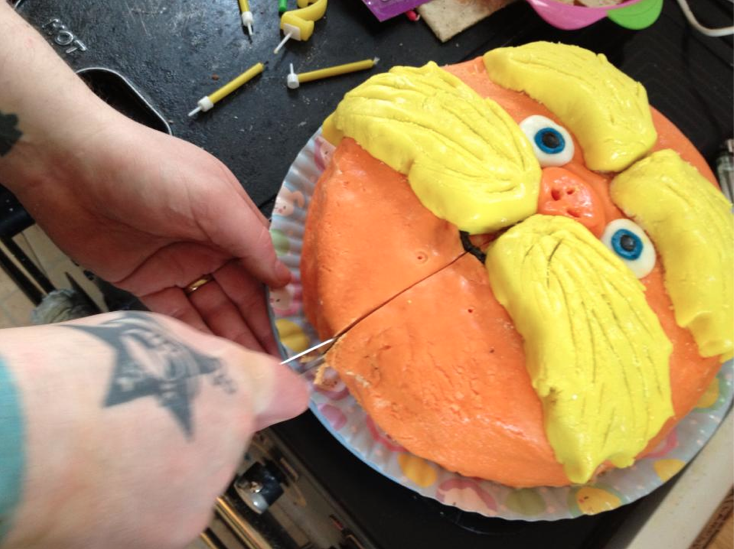 As Opeie has become Lorax, Grinch and Cat in the hat mad we decided to make Dr Seuss themed decorations and Cake. We tend to buy multiples of the books we love if we see them in charity shops as they can sometimes come in handy and Opeie's birthday gave us a great use for our extra 'The Cat in the Hat' and 'The Cat in the hat Comes Back' books. I decided that i wanted to make bunting to decorate the boys room by cutting out triangles from the books. Mrs M then stitched each piece on to ribbon and it ended up looking really nice. We're such a great team! We had originally planned to make a Cat in the Hat cake too but at the last minute we decided to make a Lorax cake instead and when i say Last minute i mean last minute. Mrs M baked the sponge cakes yesterday afternoon and i didn't start decorating it until the boys were in bed. Me and mrs M dirty iced the main base together, although Mrs M kept getting side tracked wiping butter icing on my head and licking it off (very hygienic). Not long after that (when i realised i didn't have enough fondant and had to pop to Asda) Mrs M decided to desert a sinking ship and go to bed (she had been at work though so she can be forgiven for that i guess). Ive never decorated a large cake like this before as im more of a cup cake kind of guy so i did find it a little challenging for a first attempt but after a few hours of hard graft i think the finished item came out quite well. I was a little dissappointed with it when i went to bed but it looked a lot better when i woke up (must have been the fact that i was so tired and possibly a little grumpy). Opeie was very excited when he saw it and even managed to blow the candles out on his own, making Seth (his full of air tag team partner desperate to get in on the candle action) obsolete. Love the bunting as well as the cake! We have a whole house of poorly at the moment, too, so we empathise - The boy turns three at the weekend, really hoping we're all better by then!